Using these gears consistently allows you to bring a new level of relational intelligence to your life that offers a competitive advantage in our task-driven world. All too often people go through life without truly connecting—and can, as a result, miss out on experiences and relationships that have the power to bring them great joy. By understanding how the five gears presented in this engaging book work, you can improve your ability to connect with the world around you. Improve your respect and influence—and learn a sign language that, when used, can change your perspective and your world. 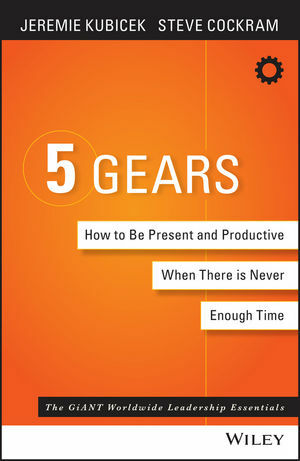 5 Gears: How to Be Present and Productive When There Is Never Enough Time is the perfect resource for anyone who wants to live and lead connected. STEVE COCKRAM is co-founder of GiANT Worldwide and a recognized expert on personality development, applied leadership learning and culture change with executive teams and organizations around the world. Steve is a soughtafter speaker and teacher on apprenticeship, personality development and team building. He resides in London with his wife and three children.